Jambeaux, everyone!!! Harambe! For this episode, we discuss the LIGHT side of the latest movie released in the Star Wars universe, The Last Jedi. MOW #197 was the DARK side, so to speak. WARNING: this is a spoiler filled episode. On today’s show, we have Kevin, Danny, Eli of www.ivorycomics.com, and Lee of Magical Moments Vacations. In addition, we welcome special guests, and long-time podcasting friends, Andy and Aimee. 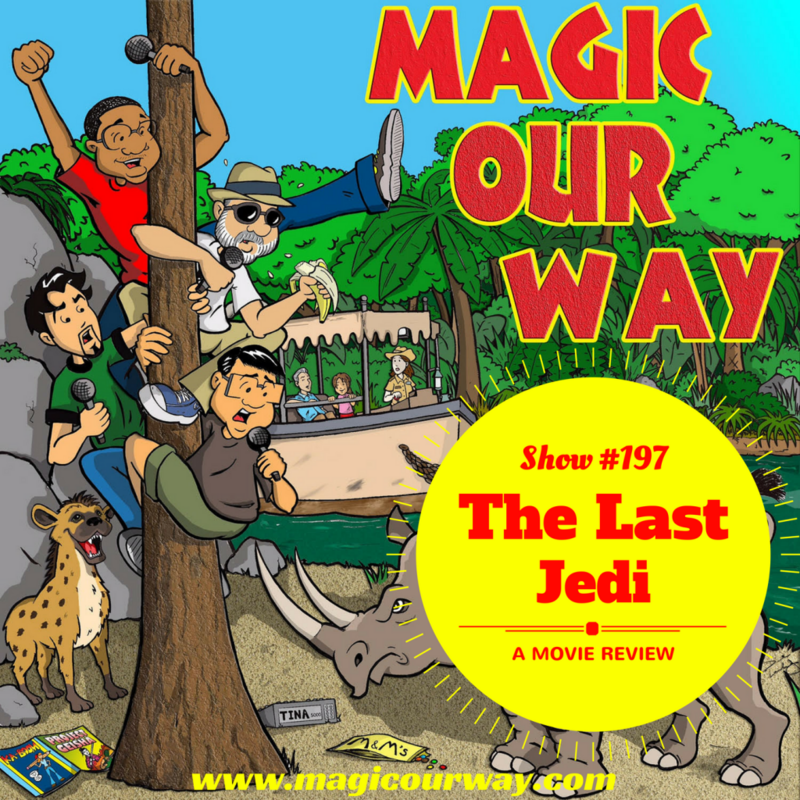 On this episode, we continue to discuss the latest movie to come out of the Star Wars franchise, The Last Jedi. However, if you consider the previous episode, MOW #197, as the dark side, this episode will present the LIGHT side. There has been much criticism of the movie and there has been much praise as well. This is a spoiler filled movie discussion. We also present an email from a long time MOWican, Eric Grubb of the 501st who came to the defense of the movie and thereby inspired this episode. Star Wars: The Last Jedi was released in time for the 2017 Holiday season on December 15th in the USA. In this movie, Rey develops her newly discovered abilities with Luke Skywalker as her teacher. At the same time, the Resistance dwindles in number as they struggle with the First Order. What did you think about our discussion? What are YOUR thoughts on this movie? Any comments? We would love to hear your opinions regarding anything we have talked about. Share them at show@magicourway.com. Your opinions are always welcome on our show. Seriously, every opinion is welcome. Jambeaux, everyone!!! Harambe! For this episode, we discuss the latest movie released in the Star Wars universe, The Last Jedi. WARNING: this is a spoiler filled episode. On today’s show, we have Kevin, Danny, Eli of www.ivorycomics.com, and Lee of Magical Moments Vacations. In addition, we welcome special guests, and long-time MOWicans, Richard Hercher and Rachelle Crow-Hercher aka Mr. and Mrs MOWnonymous. 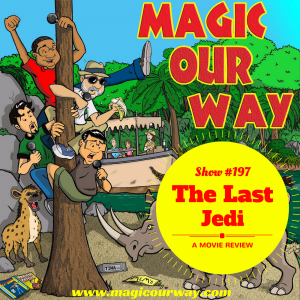 On this episode, we discuss the latest movie to come out of the Star Wars franchise, The Last Jedi. This is a spoiler filled movie review. Jambeaux, everyone!!! Harambe! For this episode, we flex our creative muscles and design hotels for the entrance of the Walt Disney World parks. We pick up right where our discussion left off on MOW #195. On this episode, we once again flex our creative muscles and design a hotel for the entrance of each of the Walt Disney World parks. We pick up right where our discussion left off on MOW #195 in which we discussed an article about a rumored front-of-Epcot hotel that is being considered. In this exercise, each of us was designed a park. Our parameters for the hotels were mostly “Blue Sky” with the notion that it had to at least make sense. What did you think about our designs? What would you build? Any comments? We would love to hear your opinions regarding anything we have talked about. Share them at show@magicourway.com. Your opinions are always welcome on our show. Seriously, every opinion is welcome. 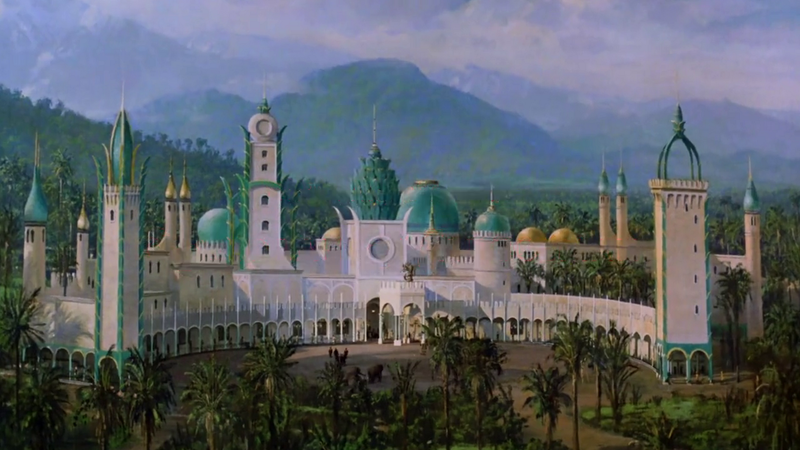 Below is the Zamunda Palace from the movie, Coming to America, that is referenced by Kevin for the design of his hotel. Kevin’s vision of Hotel Zamunda for Disney’s Animal Kingdom Park. This is from the movie, Coming to America. Jambeaux, everyone!!! Harambe! For this episode, we discuss the reigniting of the Disney Fox relationship, the rumored Epcot hotel, and we have a bit of guest services. On this episode, we read a rebuttal email from the Chief Legal Correspondent of the MOWican Nation, Harry Bernstein, “My Cousin Harry.” This email is in response to Lee’s statements regarding his visit to Harry’s hometown of Cleveland, Ohio, USA. Firstly, we discuss a rumor that seems to be gaining some steam: Disney and Fox talks, regarding the acquisition, seem to be back on. We refer to the articles below. We discuss the ramifications of the merger should the acquisition move to fruition. Secondly, we discuss a rumor that suggests that Disney is considering erecting a hotel that is attached to Future World in Epcot. We reference the below article written by Tom Corless: WDWNT. The rumor suggests that there are several possible locations in and around the front of Epcot for the hotel with these two being the most likely of options: right in front of the ball, over the turnstiles, off to the side by the The Seas with Nemo and Friends. What did you think about our discussion? Any comments? We would love to hear your opinions regarding anything we have talked about. Share them at show@magicourway.com. Your opinions are always welcome on our show. Seriously, every opinion is welcome.